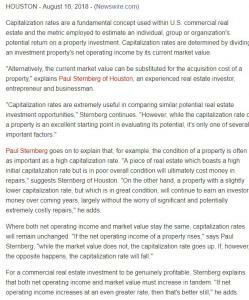 HOUSTON, TEXAS, UNITED STATES, October 25, 2018 /EINPresswire.com/ -- An important consideration for owners of commercial real estate, or those looking to invest, the option to create a 'hub and spoke' ownership structure should not be overlooked, according to Houston-based Paul Sternberg. 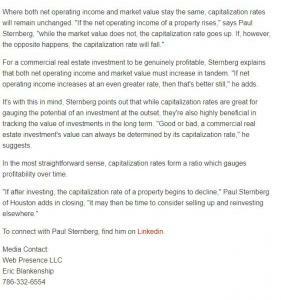 Attorney and real estate investor Sternberg reveals that, by establishing a 'hub and spoke' structure, property owners are largely insulated from personal liability, although the practice also boasts numerous other benefits. "By forming a so-called 'hub and spoke' entity LLC—or limited liability corporation—structure, commercial property investors, further to protection from personal liability, are also able to streamline ownership requirements and reduce administrative costs," suggests Paul Sternberg. "Furthermore," he continues, "'hub and spoke' structuring can also provide significant estate tax savings should a property owner pass away." Sternberg goes on to explain that the process starts with the creation of an initial limited liability corporation, or LLC. The resulting LLC then serves as the 'hub' through which an owner, or owners, may invest in multiple pieces of commercial real estate. Each investment property then has—and is owned by—its own LLC, with each of these forming the 'spokes,' according to the attorney and experienced investor. "The hub corporation owns 100% of each spoke LLC," he explains, "with income from each 'spoke' flowing through the hub LLC which was created initially." As a result, none of the 'spoke' LLCs are required to file income tax returns, as—with income flowing through the 'hub'—the spokes are essentially disregarded entities as far as tax purposes are concerned, streamlining ownership requirements as pointed out by Sternberg. 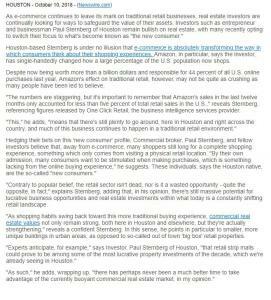 "As long as each spoke is treated as its own entity, with its own LLC, bank account and expenses, any arising liabilities associated with one piece of real estate should have zero bearing on any of the others attached to the same hub," reveals Sternberg. Another benefit highlighted by the Houston-based attorney, Sternberg also explains how hub and spoke structuring may be used to great effect in estate planning. In the event that a property owner dies, an interest in the hub may be passed to children or grandchildren, for example, he suggests, or placed in a trust for these or other individuals. 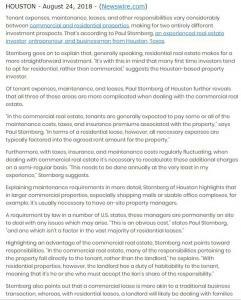 "Where an interest is gifted, steps may be taken to remove any interest in the real estate in question from the property owner's taxable estate," points out Sternberg, wrapping up, "as well as future appreciation—along with the associated income—substantially lowering any estate taxes which may otherwise be owed."